FROM ONLY £4.99!!! - RRP £15 - GREAT VALUE & QUALITY!!! N e v e r worn o n l y t r i e d on a n d p r i c e t a g s removed. N o t a s h e a v y / thick a s a regular sweatshirt w i t h l o n g sleeves, t u r n u p c u f f s a n d a p r e t t y flora l graphic. Thick knitted Tie front Top / Bolero / Shrug in Copper Gold colour. Size 18 UK. 44cm full length. Don't miss ! 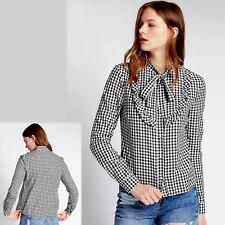 LADIES RED WINE MULTI STRIPED SHIRT BLOUSE STYLE TOP OVERSIZE SIZE 6 FROM M&S (LABELS CUT NWOT). 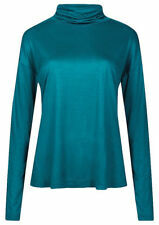 ROUND NECK WITH 2 BUTTON FRONT FASTENING & KEYHOLE BELOW, RUCHED EITHER SIDE. COMPLETE WITH DETACHABLE NECK TIE AS PICS 1/2/3/4. Beautiful white cotton size 14 broiderie anglais top BNWT . Condition is New with tags. Dispatched with Other Courier (3 to 5 days). Never worn it is in very good condition having been sitting in a draw. The sleeves have a honey combe cut out section that starts from the shoulder and runs down the length of the sleeve on the central outer part of your arm to the cuff. Bnwt M&S Limited Edition Burgundy Scoop Neck Tie Back Top Size 10. Condition is New with tags. Dispatched with Royal Mail 2nd Class. Small button on front popover Top. 💗M&S INDIGO COLLECTION WOMEN'S PINK FLORAL LONG SLEEVE BLOUSE TOP SIZE 10💗. Dispatched with Royal Mail 2nd Class. Lovely mustard colour eith patch pocket and button front with tie front. 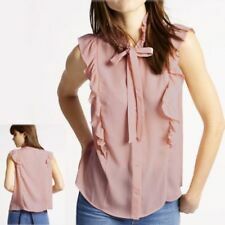 Ladies lovely tie front top. By New Look. Mantaray Cotton long Sleeve Women's T-Shirt white .worn.twice size 14 . Condition is Used. Dispatched with Royal Mail 1st Class. Marks and Spencer Indigo ladies top blouse size 12.100% cotton. 3/4 bat wing sleeves. Ruffles to sleeves. Scalloped hem. Worn once so in immaculate condition. This is a very flattering and unusual top. 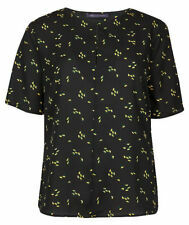 Lovely leopard print t shirt, limited edition by Marks and Spencer’s. long sleeves with fluting around cuff, around neck and hem, has a ribbed effect look. Lovely fitted top. New never worn. 36’ bust 23” length. NO FABRIC LABEL BUT IT IS 100% LINEN. NO SIZE LABEL WOULD SUIT UK 10. LENGTH 22". ARMPIT TO ARMPIT 19". 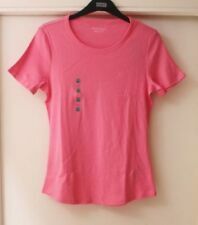 Marks and Spencer Round Neck Long Sleeve Women's shirt bust measures 52” Fantastic condition Dispatched with Royal Mail 2nd Class. Marks and Spencer Floral Print Half Sleeve Shell Women's Top - Black Mix, Size …. Dispatched with Royal Mail 2nd Class. Ladies unlined lightweight summer top in a very pretty, multi floral pattern of pinks and aqua. Puff sleeves, peterpan lacy collar fastens at back neck with a button. Length is 24 ins from back neck. Size 18 polyester with cotton collar. Unworn except maybe once last year. Non smoking household. Black Top with Pleated Detail. Condition is Used. Dispatched with Royal Mail 2nd Class. Indigo At M&S Size 20 Lilac Short Sleeve Top. Lovely colour and material - very cool and light. Condition is Used but in excellent condition. From smoke and pet free home. Dispatched with Royal Mail 2nd Class. I have lots of other items listed and more to list so why not have a look? Finally getting round to clearing years of impulse buying!!! 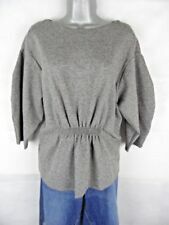 ~Ladies little top from M&S in a size 10 - as part of their Collection range ~. Brand new with tags M&S floral top, size 20, in good clean condition. Excellent condition really pretty beige and black blouse from marks and spencer’s. Size 20. Black And Gold Top M&S Size 14. Black with gold pinstripe, elasticated at waist and cuff. Condition is Used, good condition worn once. Dispatched with Royal Mail 2nd Class. Ladies M&S Classic navy and white striped top. Size 18.